I will be at the NAMM show in Anaheim with the J-700 tuba and I-800 Euphonium. Unfortunately I will not have the Weingrill tubas and Euphs but I will have them at the Army show. Plans are to have the Nirschl J-880 CC tuba at that show as well. Then plans are to take the whole dog and pony show to TMEA in San Antonio February 10-13. I will be in Texas the week following TMEA for special appointments showing the instruments. 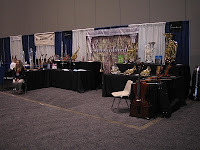 I have posted the new professional pictures of the aforementioned instruments on the apporpriate links at the right. Midwest Band and Orchestra Convention 2009 was in McCormick place for the first time. I, for one, like the new venue. Lots of room; high ceiling/we can talk while people are playing. Thanks to everyone who came by to look at new product. The French horns were a big hit. It's taken a while for the word to spread about the advantages of the 3/4 double but consensus is that it is great for beginners and a very good horn beyond the beginner stage. College players are always impressed with the D-88O big Kruspe-style nickel horn with all its extra features. 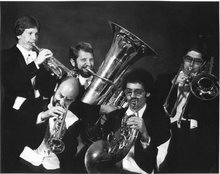 The J-700 4/4 BBb tuba was a big draw, thanks in part to Don Harry spreading the word. I will have it on display at NAMM, the Army Conference in DC and at TMEA. Some dealers have it in stock already, Buckeye Brass, Rieman Music and Griggs Music among them. The CC tuba and the new Weingrill rotor tuba did not arrive in time but I will have both for the Army Conference Jan 27-30 at Ft Meyer. I will have the new Weingrill compensating Euphonium there as well. It is a totally new design. I posted some pictures from Midwest on the link at the right.